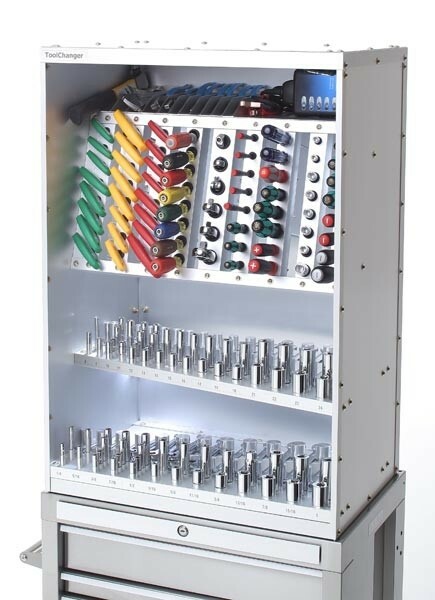 The new ToolChanger toolbox is probably the most organized toolbox I have seen and the designers took the old "place for everything"saying to heart. What they come up with is a system to organize mostly mechanic-type tools in a way where each tool has its own place and is positioned in a way where they are the most visible. The top section of the ToolChanger features angled columns with rubberized holes in them that accept hand tools like screwdrivers or Allen wrenches. The angled position of the columns look to hold the tools well, but also positions them ideally so the size markings on the handles can be read. 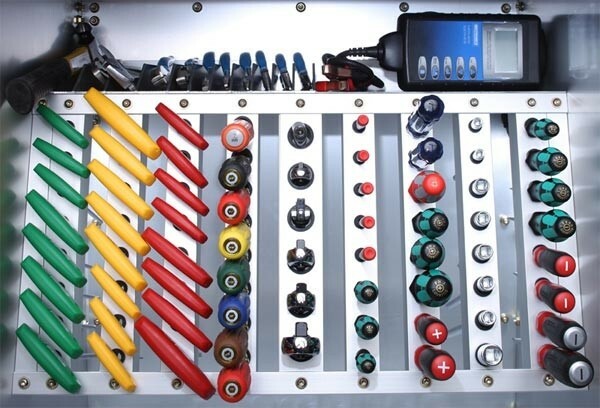 The bottom half of the ToolChanger has the task of organizing your sockets and wrenches. Two separate levels – one for metric and one for SAE – feature labeled rows where both wrenches and sockets are arranged inline from front to back. This means, if you are using a 1/2" socket and you need to switch to an open-ended wrench of the same size, you will find both within inches of each other. The whole system has been spaced so that every tool can be easily accessed while wearing gloves. 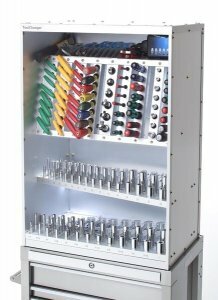 The ToolChanger system is designed to ride on top of a standard 26-inch wide tool cabinet, but I am sure it can be mounted on a wall, or easily place on a workbench. 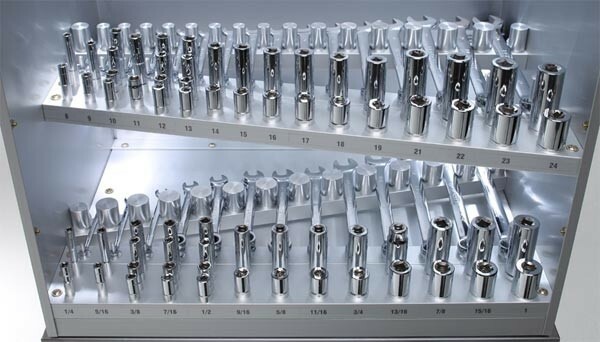 The walls and racks of the ToolChanger are made out of anodized aluminum, and the pegs and spacers are machined out of solid aluminum. The model shown (Model 261838) goes for just under $1,500 or you can purchase a customized unit to fit your needs.